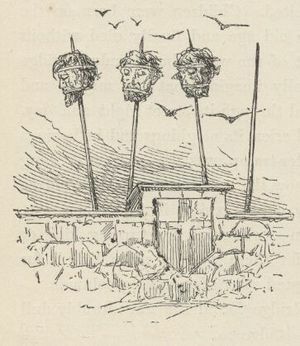 An artist's impression of the "Ground Zero Heads on Spikes" project. GROUND ZERO, New York City -- Supporters of the Tea Party movement have demonstrated in opposition to plans to "display the severed heads of 9/11 victims on spikes at Ground Zero." A group of victims' relatives, 9/11 Families for a Safe & Strong America, called the proposal "a gross insult to the memory of those who were killed on that terrible day". "As if the mosque wasn't bad enough," former Alaska Governor Sarah Palin told reporters, "now they want to dig up the decaying corpses of the innocent Americans who died on September 11th, decapitate them, and impale their heads on steel spikes at the World Trade Center site. I think it's insensitive." Former House Speaker Republican Newt Gingrich decried the proposal as a symbol of Muslim "triumphalism," claiming that "wherever Muslims have a victory, they build a mosque and impale the decapitated heads of their vanquished foes on pikes as a symbol of their conquest." "It would be like putting a Nazi sign next to the Holocaust Museum," he added. Supporters of the proposal, however, accuse opponents of being "misleading" and "hysterical". They claim that the name "Ground Zero Heads on Spikes" is inaccurate, since the project is in fact a small kebab shop being built by a Turkish man in Coney Island. "The only thing we will be impaling is succulent pieces of lamb meat on vertical skewers, which will then be carved off and served with pita bread, vegetables and barbecue sauce," the shop's owner Mustafa Okyar told UnNews. "We will also serve falafel," he added. Meanwhile, Sarah Palin and right-wing television host Glenn Beck have expressed their support for a project to construct a giant force field that will exclude all traces of Islamic and Arabic culture from Manhattan. This page was last edited on 5 June 2012, at 09:04.